Apologies to those who subscribe to just the Feed of Personal Posts as my feeds have been getting their knickers in a twist lately. You may not have known it, (and why should you?) but Monday in Ireland was a Bank Holiday. This is one of those days where everyone asks everyone what the time is despite or because of a proliferation of clocks around. The list of books for October 2008 through to May 2009 has been added to the Irish Book Club page. O’Malley’s Irish Pub in Weston, Missouri are planning a big Halloween party on Halloween itself, Friday, October 31st, 2008. The band Roscommon are another Irish trad for the Kansas City area. 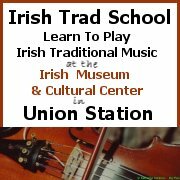 Just a quick note that the Kansas City Irish events calendar has been updated to show events for October 23 2008 to October 31. Things are relatively quiet on this part of Irish KC at the moment, because things are changing again. Roger Landes performs at the Haverty Center in Benedictine College on Wednesday, October 29th, 2008 at 7:30 pm. South Kansas City’s Irish pub, The Gaf, features in a “10 Hot KC Restaurants” list on the blog of the Kansas City Traveling Gourmet.